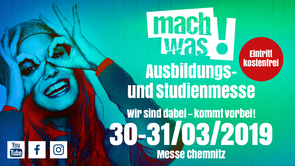 At “Mach was!”, we will be informing all those interested about the training occupations of assistant tax consultant and office management assistant as well as about opportunities for dual studies or internships. The training and study fair will take place on 30. and 31. March 2019 from 10 a.m. to 4 p.m. in the fair Chemnitz. We will be there on both days and await you at our booth!